Given the central role of the United States, the U.S. presidential election in November promises to have a significant impact on all the issues tracked by the Forum on the Arms Trade. To serve as a resource, the positions of the Democratic presidential candidate Hillary Clinton and Republican presidential candidate Donald Trump are outlined and analyzed here on selected topics. 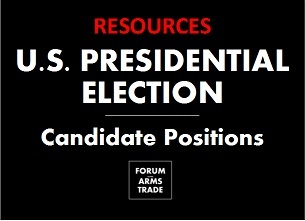 Until the election occurs, this effort will be a work in progress, and we welcome feedback and additional information on candidates positions, which can be sent to info@ForumArmsTrade.org. (See also "Methodology" at the end of this page.) Assessments here are not endorsed by Forum experts nor the candidates. Click here for fuller analysis and quotes. Clinton has expressed support for the United States joining the Mine Ban Treaty. No statement have been found by Trump on the topic, but he is not expected to support the treaty. ​Click here for fuller analysis and quotes. Both candidates are expected to support security assistance to some countries in the Middle East as well as some use of U.S. military forces there. Clinton has generally expressed a desire not to put U.S. "boots on the ground" in the region. Trump has expressed some willingness to work with Russia, but it is difficult to assess how and to whom he might provide weapons and training, or where he'd directly use U.S. military airpower or other military force. Presidential candidates have not made explicit statements about many of the topics tracked by the Forum on the Arms Trade. In describing the positions of candidates, great effort is placed in directly linking to relevant statements, official positions as described on candidates' websites, past votes (where relevant), and other documented sources so that readers may reference those directly. Additional analysis is also provided, often indicated by the word "expected." This resource will be continually updated until the election. We welcome feedback and other information from those who use this resource (please contact us via email). Jeff Abramson manages the project with research assistance from Alicia Jensen, who together consult with Forum-listed experts. (Nicholas Hitchens-Spellman aided in initial research.) Assessments here are not endorsed by other experts, the Forum on the Arms Trade, nor the candidates.